Convenient Travel Size. Powerful Images to remind you of the Great Blessings flowing through the Spiritual Lineage of the Pranic Healing Mission. 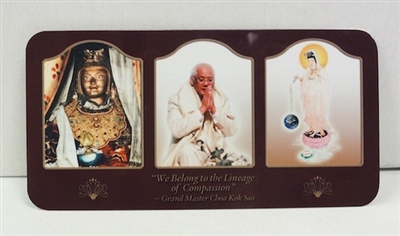 This metal altar includes images of the Buddha Kwan Yin, Mahaguruji Mei Ling & GrandMaster Choa Kok Sui. Quote by GrandMaster Choa on center panel says "We Belong to the Lineage of Compassion". Keep one with you at all times... in your purse, luggage, car dashboard or visor, at your desk, for the headboard of your bed or for your hotel room. The metal material protects from wear and tear.